Two Surgeons from the UK, Dr Ghassan Abu Sittah and Dr Swee Ang, managed to get into Gaza during the Israeli invasion. Here they describe their experiences, share their views, and conclude that the people of Gaza are extremely vulnerable and defenseless in the event of another attack. Over the period of 27 December 2008 to the ceasefire of 18 Jan 2009, it was estimated that a million and a half tons of explosives were dropped on Gaza Strip. Gaza is 25 miles by 5 miles and home to 1.5 million people. This makes it the most crowded area in the whole world. Prior to this Gaza has been completely blockaded and starved for 50 days. In fact since the Palestinian election Gaza has been under total or partial blockade for several years. On the first day of the invasion, 250 persons were killed. Every single police station in Gaza was bombed killing large numbers of police officers. Having wiped out the police force attention was turned to non government targets. Gaza was bombed from the air by F16 and Apache helicopters, shelled from the sea by Israeli gunboats and from the land by tank artillery. Many schools were reduced to rubble, including the American School of Gaza, 40 mosques, hospitals, UN buildings, and of course 21,000 homes, 4,000 of which were demolished completely. It is estimated that 100,000 people are now homeless. The weapons used apart from conventional bombs and high explosives also include unconventional weapons of which at least 4 categories could be identified. The bombs dropped were described by eye witnesses as exploding at high altitude scattering a large canopy of phosphorus bomblets which cover a large area. During the land invasion, eyewitnesses describe the tanks shelling into homes first with a conventional shell. Once the walls are destroyed, a second shell – a phosphorus shell is then shot into the homes. Used in this manner the phosphorus explodes and burns the families and the homes. Many charred bodies were found among burning phosphorus particles. One area of concern is the phosphorus seems to be in a special stabilizing agent. This results in the phosphorus being more stable and not completely burning out. Residues still cover the fields, playground and compounds. They ignite when picked up by curious kids, or produce fumes when farmers return to water their fields. One returning farming family on watering their field met with clouds of fumes producing epistaxis. Thus the phosphorus residues probably treated with a stabilizer also act as anti-personnel weapons against children and make the return to normal life difficult without certain hazards. Surgeons from hospitals are also reporting cases where after primary laparotomy for relatively small wounds with minimal contamination find on second look laparotomy increasing areas of tissue necrosis at about 3 days. Patients then become gravely ill and by about 10 days those patients needing a third relook encounter massive liver necrosis. This may or may not be accompanied by generalized bleeding , kidney failure and heart failure and death. Although acidosis, liver necrosis and sudden cardiac arrest due to hypocalcemia are known to be a complication of white phosphorus it is not possible to attribute these complications as being due to phosphorus alone. There is real urgency to analyze and identify the real nature of this modified phosphorus as to its long term effect on the people of Gaza. There is also urgency in collecting and disposing of the phosphorus residues littering the entire Gaza Strip. As they give off toxic fumes when coming into contact with water, once the rain falls the whole area would be polluted with acid phosphorus fumes. Children should be warned not to handle and play with these phosphorus residues. The use of DIME (dense inert material explosives) were evident, though it is unsure whether depleted uranium were used in the south. In the civilian areas, surviving patients were found to have limbs truncated by DIME, since the stumps apart from being characteristically cut off in guillotine fashion also fail to bleed. Bomb casing and shrapnel are extremely heavy. Bunker busters and implosion bombs have been used . There are buildings especially the 8 storey Science and Technology Building of the Islamic University of Gaza which had been reduced to a pile of rubble no higher than 5-6 feet. People in Gaza described a silent bomb which is extremely destructive. The bomb arrives as a silent projectile at most with a whistling sound and creates a large area where all objects and living things are vaporized with minimal trace. We are unable to fit this into conventional weapons but the possibility of new particle weapons being tested should be suspected. Survivors describe Israeli tanks arriving in front of homes asking residents to come out. Children, old people and women would come forward and as they were lined up they were just fired on and killed. Families have lost tens of their members through such executions. The deliberate targeting of unarmed children and women is well documented by human right groups in the Gaza Strip over the past month. Thirteen ambulances had been fired upon killing drivers and first aid personnel in the process of rescue and evacuation of the wounded. The first patients wounded by cluster were brought into Abu Yusef Najjar Hospital. Since more than 50% of the tunnels have been destroyed, Gaza has lost part of her lifeline. These tunnels contrary to popular belief are not for weapons, though small light weapons could have been smuggled through them. However they are the main stay of food and fuel for Gaza. Palestinians are beginning to tunnel again. However it became clear that cluster bombs were dropped on to the Rafah border and the first was accidentally set of by tunneling. Five burns patients were brought in after setting off a booby trap kind of device. 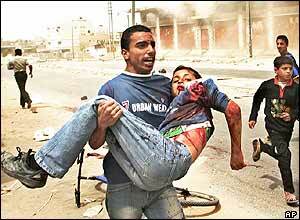 As of 25 January 2009, the death toll was estimated at 1,350 with the numbers increasing daily. This is due to the severely wounded continuing to die in hospitals. 60% of those killed were children. The severely injured numbered 5,450, with 40% being children. These are mainly large burns and polytrauma patients. Single limb fractures and walking wounded are not included in these figures. Through our conversations with doctors and nurses the word holocaust and catastrophe were repeatedly used. The medical staff all bear the psychological trauma of the past month living though the situation and dealing with mass casualties which swamped their casualties and operating rooms. Many patients died in the Accident and Emergency Department while awaiting treatment. In a district hospital, the orthopaedic surgeon carried out 13 external fixations in less than a day. It is estimated that of the severely injured, 1,600 will suffer permanently disabilities. These include amputations, spinal cord injuries, head injuries, large burns with crippling contractures. No escape: As Gaza is sealed by Israeli troops, no one can escape the bombardment and the land invasion. There is simply no escape. Even within the Gaza Strip itself, movement from north to south is impossible as Israeli tanks had cut the northern half of Gaza from the south. Compare this with the situation in Lebanon 1982 and 2006, when it was possible for people to escape from an area of heavy bombardment to an area of relative calm – there was no such is option for Gaza. Gaza is very densely populated. It is eerie to see that the bombs used by Israel have been precision bombs. They have a hundred percent hit rate on buildings which are crowded with people. Examples are the central market, police stations. Schools, the UN compounds used as a safety shelter from bombardment, mosques (40 of them destroyed), and the homes of families who thought they were safe as there were no combatants in them and high rise flats where a single implosion bomb would destroy multiple families. This pattern of consistent targeting of civilians makes one suspect that the military targets are but collateral damage, while civilians are the primary targets. The quantity and quality of the ammunition being used as described above. Gaza’s lack of defense against the modern weapons of Israel. She has no tanks, no planes, no anti-aircraft missiles against the invading army. We experienced that first hand in a minor clash of Israeli tank shells versus Palestinian AK47 return fire. The forces were simply unmatched. Absence of well constructed bomb shelters for civilians. Unfortunately these will also be no match for bunker busters possessed by the Israeli Army. Taking the above points into consideration, the next assault on Gaza would be just as disastrous. The people of Gaza are extremely vulnerable and defenseless in the event of another attack. If the International Community is serious about preventing such a large scale of deaths and injuries in the future, it will have to develop a some sort of defense force for Gaza. Otherwise, many more vulnerable civilans will continue to die. Over the period of 27 December 2008 to the ceasefire of 18 Jan 2009, it was estimated that a million and a half tons of explosives were dropped on Gaza Strip. Suppose the IDF terrorists have 250 airplanes in action, surely an overestimate. Then each airplane has to drop 300 one-ton bombs every day, which is about one every five minutes, around the clock. The maximum bomb-load for an F-15E is twelve tons. Therefore each plane has to fly twenty-five times per day, returning to base to re-arm after each one. This doesn’t account for helicopter rockets and 155mm artillery shells, which weigh only a small fraction of one ton each. It still doesn’t seem possible. Perhaps this estimate has one or two zeros too many? i think we shouldnt miss the point.The point is they have been bombed daily and night.